In less than a week I’ll be home in Philadelphia and hopefully – finally – back to the normal life of a great diocese. I use that word “great” deliberately. What makes Philadelphia unique is not its legacy, or industries, or universities, or cultural centers. All these things are important, but they’re just words until we remember the people who give them life. The Church in Philadelphia is “great” because of her people. She’s blessed in her clergy, religious and lay faithful. Above all, she’s blessed in her families, rich and poor, who sacrifice to support their parishes and do their best to live the Gospel week in and week out. And nothing captured the real character of Philadelphia more beautifully than the outpouring of enthusiasm and love from tens of thousands of families that greeted Pope Francis last month and made the World Meeting of Families such a memorable success. 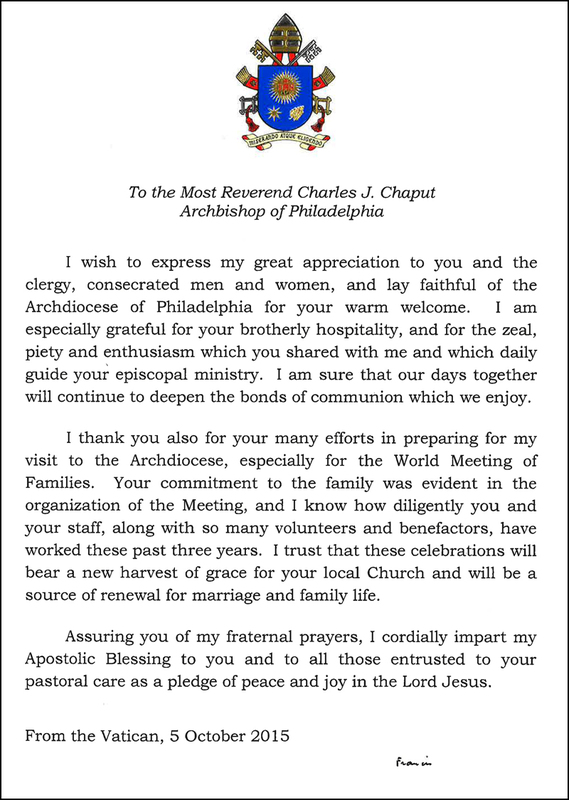 I wish to express my great appreciation to you and the clergy, consecrated men and women, and lay faithful of the Archdiocese of Philadelphia for your warm welcome. I am especially grateful for your brotherly hospitality, and for the zeal, piety and enthusiasm which you shared with me and which daily guide your episcopal ministry. I am sure that our days together will continue to deepen the bonds of communion which we enjoy. I thank you also for your many efforts in preparing for my visit to the Archdiocese, especially for the World Meeting of Families. Your commitment to the family was evident in the organization of the Meeting, and I know how diligently you and your staff; along with so many volunteers and benefactors, have worked these past three years. I trust that these celebrations will bear a new harvest of grace for your local Church and will be a source of renewal for marriage and family life. Assuring you of my fraternal prayers, I cordially impart my Apostolic Blessing to you and to all those entrusted to your pastoral care as a pledge of peace and joy in the Lord Jesus. The issues of modern family life are complex. They have great importance for the future of the Church and the world. So the work of this synod matters. True to his style, Pope Francis has encouraged an open and frank spirit from the start. Differences among the synod fathers – including serious differences on serious matters – are part of the natural flow of discussion. Bishops at the synod need to deal with such matters candidly. Otherwise, nothing good can result. But “warring camps” simply don’t exist. The mood among the synod fathers has been far friendlier than any commentators seem to imagine. There are no “revolutionaries” or “reactionaries” in the synod hall – only bishops sincerely trying to face sensitive issues and chart the right course for the Church in the light of the Gospel. Which brings me to why this synod experience has also been hopeful. It’s one thing to hear about the “catholic” nature of the Catholic faith. It’s another, deeply reassuring thing to see it alive in the intelligence and dedication of bishops from around the world gathered as brothers in one place. The synod’s lay auditors, including married couples, have offered invaluable counsel in our small group discussions. So have the fraternal (i.e., ecumenical) delegates. The point is: Whatever develops in the short term from this synod, God remains with his Church. We should cultivate that peace in our hearts. We need to trust in God’s Word, and we need to pray for and trust the Holy Father. Otherwise we defeat our own discipleship. Confusion – as I was famously misquoted, out of context, a year ago – is of the devil. We shouldn’t be part of it. It will be good to be back in Philadelphia. It will be good to be home. We have a lot of great work to do together. Something kicked us off your E-Mail list awhile ago, but happy to be back now. Joe Vogel. If no warring camp”, there is at least one “warrior” who is very disturbing: Australian Cardinal Pell does a real disservice to the Synod by his press interviews publicly criticizing individual German bishops. His behavior has been so extreme that the German working group expressed their dismay at it in their report and in their remarks at the Vatican press briefing. It’s a real shame; Cardinal Pell is not creating a very good impression of our Church to Catholics and to the rest of the world. I think Cardinal Pell has expressed the orthodox doctrine of the Church which Jesus instituted while many others have been trying to water down the teaching of the Gospel. If we keep on adapting the doctrines of the Church to the postmodern culture of the world which is mostly inimical to the Catholic faith, I fear in 100 years, the Church Jesus instituted will be a nominal church. Thanks to the promise of the Lord, the Church will continue till the end of the world. I hope the Synod leads to long term action across the board in the Church and the re-structuring of parish ministries to strengthen marriage and family. We can begin by praying for the OTHER vocation in service to communion at least half as often as we pray for celibate vocations at liturgy. Most of the current Synod sentiments and concerns could have been expressed before and during the FIRST Synod on the Family (1980). And 35 years later, we need another one. Why? No action was taken. I worked in the Church during the very fertile vision of John Paul II, but the bishops did not take Familiaris consortion (1981), nos. 65 and 70 seriously. God willing, they will this time. AS Francis said, ““a Christianity which ‘does’ little in practice, while incessantly ‘explaining’ its teachings, is dangerously unbalanced. I would even say that it is stuck in a vicious circle.” God willing, we won’t need another synod in 35 years. 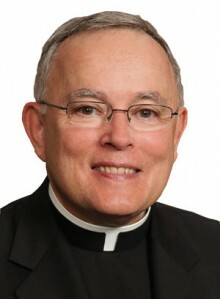 Thank you Archbishop Chaput for your updating messages throughout the Synod. You have been a voice of hope and reason for all of us in a time when one can hardly trust the media to report anything that is accurate. God bless your return home and you are in our prayers. Jack Sharpe for Bethlehem Community of Benedictine Oblates in North Dakota.